Aizawl/Agartala, May 18 : A Manipuri group of activists has demanded the reintroduction of Inner Line Permits (ILP) in northeastern states to “protect the indigenous and domicile” people in the region. “In the first phase of our agitation, we will not allow non-Manipuri people to enter Manipur between June 1 and June 5 if the ILP system is not reintroduced by May 31,” Sapamacha Jadumani, spokesperson of the Joint Committee on Inner Line Permit (JCILP), told reporters in Imphal. “We are not against non-Manipuris visiting the state. We have been demanding that the central and state governments reintroduce the ILP system in Manipur to protect the distinct identities of the indigenous people in the region,” he said. The JCILP is a conglomeration of various social organisations and students groups. The ILP, or the Bengal Eastern Frontier Regulation, has been in force in the region since 1873. It was withdrawn from the state to boost tourism. The ILP system is now in force in Mizoram, Nagaland and Arunachal Pradesh. Tribal-based parties Indigenous Nationalist Party of Tripura (INPT) and the Khasi Students Union (KSU) of Meghalaya have also been demanding that the ILP be promulgated in their states to protect the aboriginal people. The North Eastern Students Organisation (NESO), a powerful organisation in the region, has been demanding that the ILP be brought back in the entire mountainous region to protect ethnic tribals and other indigenous communities. In Mizoram, at least 460 non-tribals without ILP have been detained during the past two months after the influential Young Mizo Association (YMA) launched an agitation to reinforce the permit system effectively. “Those identified as staying in the state without ILP or fake ILP were presented before local courts and, when convicted, they have been deported to their states,” a senior police official told reporters Friday in Aizawl. 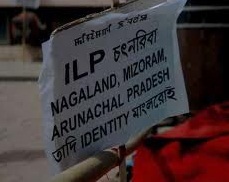 Under the ILP rule, people from outside Nagaland, Mizoram and Arunachal Pradesh have to obtain ILP before or immediately on entering these states. The regulations of the ILP were made by the then British rulers to ensure that the tribal and indigenous people in the northeastern region, undeveloped and lesser in population, were safeguarded and protected from assimilation by larger communities from outside the region.